These are my people. These people have lived in the trenches with me for the last 20 years. 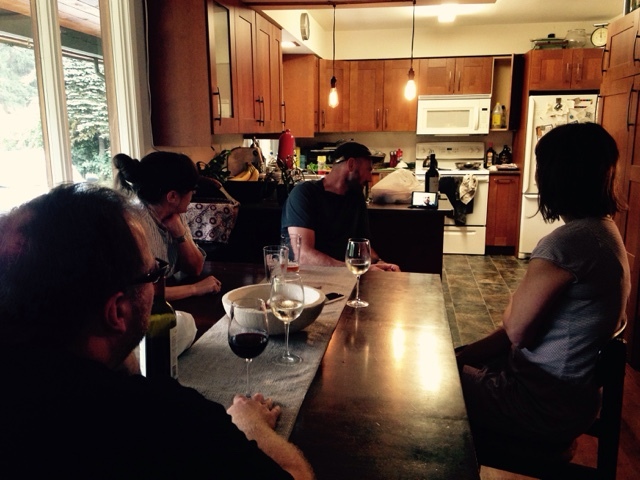 I love the all We were a gathering of five with one soul still in Moncton and we were skyping together making plans for when he would arrive next week. I am on a mission to create myself a life that will allow me to spend more time with my friends and family. Mr W and I are the eldest of this tribe. That means that we are marching towards retirement - well he is marching towards retirement - as I see myself as an entrepreneur and you never really retire.... you are always working on something which is exactly the way I would want it. I would love my friends to join me in my business - for now they are supportive in each of their own way. As a group I know they want me to succeed. I want to succeed to show that I can. This is a pretty strong motivation. In other news - I am reading again. This seems like a small miracle. It has been a struggle to force myself to focus on one task - like reading 10 pages of a good book in the morning. Then on the weekends I have started reading novels. My goal this summer was to read 10 books - 5 non fiction and 5 fiction. I have read one of each. In my JOB world - we have hired a publisher and so we will have a new leader at the helm. This is very good news. My daughter has decided she is not going to take a semester off school and has registered for classes this September. She will be living at home with us and commuting. Our son leaves in just over a month for his Fine Woodworking Program up in Nelson. And so we will be the opposite of last year. The daughter at home and the son away. I am desperately missing my DSLR. OK Not desperate. But feels like it. I have my film camera that I out of the habit of using - so with a little changing of behaviour - I could get back into the habit and I do love film so that is not entirely out of the question. The air is changing - dare I say it feels a bit like we are starting to transition into fall. Which is completely nuts because we are not even in August - I start some holidays next week and we anticipate it will be hot and sunny. glad you are reading again. it can take a lot of time to re-find one's groove. God's blessings to you.